Outside of national mapping agencies, reference and statistical cartography many of the maps we see and enjoy regularly are satirical. They are designed to provoke some emotional response often based on stereotypical imagery and labels. We are meant to see them as light-hearted in the main though, of course, they can be successfully used to make very powerful political or socio-economic statements. Fred Rose’s pictorial illustration depicts the threat posed to British interests by Russian territorial ambitions during the Balkan crisis in late Imperial Europe. It falls into the latter category of propaganda mapping though takes a highly artistic approach in an attempt to woo the reader with humour. Rose’s concept is simply to take country boundaries and paint a picture of an individual that represents some particular national identity. The use of maps in this way feature heavily in cartoons and other satirical works where familiar shapes of countries are coupled with images of people or events to make a geopolitical point. Rose makes good use of the fishing metaphor to illustrate which countries are fishing and what their catches (colonial possessions) are. The title is absolutely critical to this map’s impact. Without it we may wonder what the imagery represents yet the carefully crafted words give us not only a clear key to the metaphor but also lead us to the same impression that the map-maker intends. Certain countries are fishing and being antagonistic or even threatening. Others countries are shown as innocent and under attack. Even the fact the map has a subtitle explaining as a serio-comic map is important – it’s the clear message that this is meant to be taken as satire. Such a statement may be construed as an attempt to avoid accusations from those who may not necessarily appreciate the humour. It’s a highly illustrative and engaging form of cartography that draws the eye in to explore the interplay between figures and parts of the map. 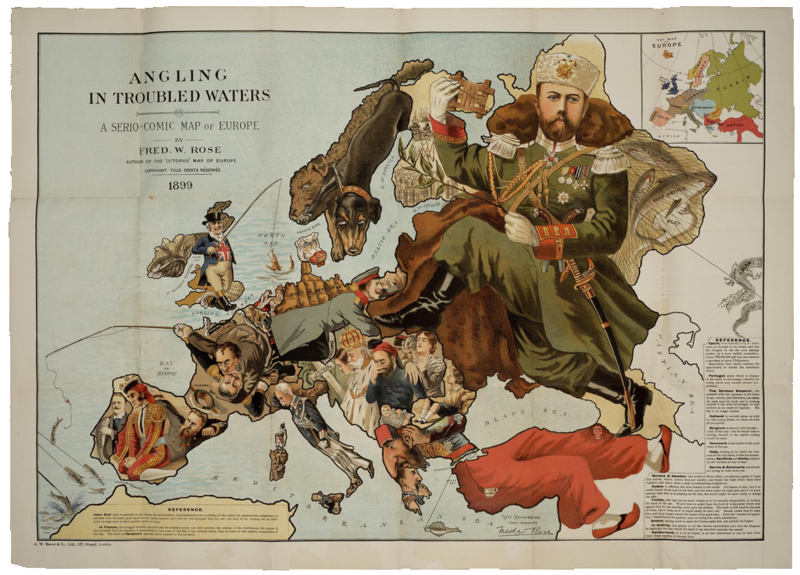 As a means of stirring debate and controversy, these types of map are a particularly provocative way of capturing the imagination. The use of map shapes and images as a basis for artistic impression is a good approach to communicate such messages since the outlines of countries are familiar shapes and artists such as Rose successfully play on the familiarity to evoke a response. He provides an exceptional example of the genre with this map. This entry was posted in MapCarte and tagged artistic, humour, MapCarte, satirical by @kennethfield. Bookmark the permalink.